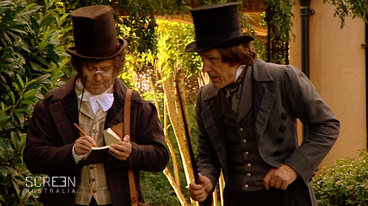 Video clip synopsis – In 1819 British Commissioner John Thomas Bigge investigates accusations that the colony of NSW has become a land of opportunity for convicts under Governor Lachlan Macquarie. Broadband MP4 nswdemoc_bb.mp4 (7.8MB), suitable for iPods and computer downloads. Democracy and the Colony of NSW is an except from the documentary Honour Among Thieves part one of a two-part series entitled Rogue Nation, produced in 2008. Historian Michael Cathcart introduces John Macarthur and the powerful faction of landowners, entrepreneurs and local military who take on Governor William Bligh and trigger Australia’s only military coup, the Rum Rebellion of 1808. Historian Michael Cathcart tells the epic story of how the colourful characters of early colonial Australia transformed a penal settlement into a land with rights and opportunity in a mere 40 years. Meanwhile Earl Bathurst and his Colonial Office not surprisingly decided that this was pure madness. Australia for the convicts and their children? Australia, from their point of view, is a colony of Britain, a place of salutary terror to scare would-be criminals into virtue, and a place (after the war with Napoleon finished in 1815 and a whole army was disbanded and given nothing to live on) to dump surplus population. It’s all getting a bit too lax down there, too free and easy. For goodness sake, ex-convicts are being made magistrates! And invited to the Governor’s table for dinner! Had the place gone completely crazy? With Governor Darling (1825-1831) Britain again tries toughness. Ex-convicts were no longer to be so encouraged – instead it will be new free arrivals with plenty of capital. There would be no more convicts earning money on the side, no more handing out of Tickets-of-leave to prisoners fresh off the boat. Neither would they be any longer given land to farm when their time expired. But after some wrangling, ex-convict legal rights remained – but then again, they had to, they owned over half the wealth of the colony. Meanwhile, a young William Wentworth was in London, and outraged at being “outed” as a child of a convicted criminal – even if the crime was a rather dashing and romantic one – highwayman. A “currency lad”, part of the first generation of native-born colonials, he took up the cudgels for a lifetime of retaliation. Wentworth invented himself as a patriot for the newly imagined country, “Australia”. The ex-convicts and their children feel this country to be theirs, feel that they belong here and won’t go back in a way the free arrivals, the “Exclusive” class, simply do not. Wentworth will be one of the first to tap into this widespread feeling, and express it in his newspaper, “The Australian” as he fights his personal and political battles. John Macarthur and his son tell Mr Bigge what they want to see happen in the colony of NSW. What sort of a world are they describing? Why do the Macarthurs want to create an aristocracy with a servant class made up of the convict and ex convicts? What do they see would be the benefits of this to them, and to the colony? Do you think this is a good idea? Why or why not? In this scene, look for and list the reasons why the Macarthurs disagree with Governor Lachlan Macquarie’s belief in supporting the convicts to do better and letting them take on positions of responsibility in the colony? What does Macarthur mean when he says ‘There is a dangerous democratic feeling taking root here. We must nip it in the bud.’ Research the meaning of the word ‘democracy’. Why would the convicts and poor settlers want democratic rule in the colony? Why would some business people like Macarthur want to stop it? John Macarthur tells Bigge that his daughter Elizabeth has refused an offer of marriage from William Wentworth because of the ‘convict stain’. What do you think the ‘convict stain’ is? Look carefully at how the filmmakers show Elizabeth in this scene. How do you think she feels about this? Do you think she agrees or disagrees with her father? How does the filmmaker convey this subtle information to the audience? Look carefully at how Mr Bigge responds to the Macarthurs’ ideas. Do you think Bigge agrees or disagrees with them? How do the filmmakers show this? Find out more about Mr Bigge the British Commissioner, sent from London to investigate the colony under the leadership of Governor Lachlan Macquarie. At the end of the clip, the narrator Michael Cathcart comes into the frame with Bigge and John Macarthur in the background. Why do you think the filmmaker does this? Do you think this technique works in helping to tell the story? What does the narrator mean when he says ‘Mr Bigge likes what he hears. Australia as a wool exporting country run by prosperous ‘exclusives. Just the thing to keep a decent Britain safe from radicals and democrats.’ What does the prosperity of the colony have to do with politics and business in Britain? What does he mean by the word ‘exclusives’? Examine the virtual copy of Bigge’s final report online at the NSW State Library website, see URL below. Pretending you are Bigge, write a brief mini-report giving your opinion on the current situation in the colony after this meeting with the Macarthurs.